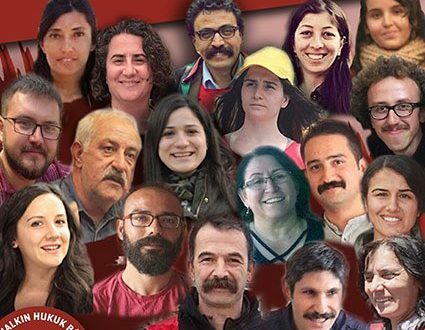 We want to make a call to people to come together at the same time as the 9th Eyüp Baş Symposium in Turkey, in solidarity with lawyers imprisoned for their struggle for the peoples of the world, for rights and freedoms, for the poor, the oppressed, and for representing the people as opposed to the bosses. The trial of lawyers, who have committed a “major crime”, namely being lawyers of revolutionaries, will begin on 10th September. -To be the lawyer of the miners killed in Soma and Ermenek. – Being lawyers for Nuriye Gülmen, Semih Özakça and other public workers. – Being lawyers for the revolutionaries who have been imprisoned in the fight against imperialism and fascism. – Being lawyers for the revolutionaries who have been arrested in the fight against prostitution. – Being lawyers for students who are imprisoned in the struggle against a free, scientific, democratic university education. – Being lawyers of TAYAD members and artists of the people. 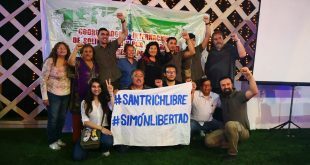 The lawyers of revolutionaries continue to defend their clients even while in prison themselves. For this reason, they have been denied access to them for years, a communication ban on letters and phone calls is being applied. Lawyers Yaprak Türkmen and Selçuk Kozağaçlı in Silivri Prison are kept in isolation in a single cell. Lawyer Engin Gökoğlu’s arm was broken while he was in Tekirdağ Prison.